I adopted this recipe from the French “Soupe verte a la creme” version. Rinse your lettuce and, if you are using a head of lettuce, chop the lettuce. Melt the butter in a heavy saucepan over medium heat. Add onion and cook until softened, about 5 minutes. Add garlic and cook for another minute. Add lettuce and cook until wilted, stirring occasionally. Add asparagus, broth, water, salt, and pepper and simmer, uncovered, 10 minutes. At this point, it looks like unappetizing seaweed, but stick with it. Eierstich mit Sahne in der Mikrowelle, German Recipe for the microwave. You need two baking pans to bake the royale. You will make a water bath (bain marie) for the royale custard. One can be a heatproof teacup or a ramekin which fits inside the second pan. The second, larger pan will hold hot water for baking the custard so it does not curdle. Heat oven to 300°F. Boil several cups of water for the water bath. Generously butter the form you’re using (can be a teacup, a ramekin or a small casserole dish), line with a piece of wax paper cut to fit the bottom and butter that, too. Heat the milk or cream in a small pan to just below the boiling point. Beat the egg, egg yolks, nutmeg, and salt together. While whisking constantly, pour the hot milk in a thin stream into the eggs. Let the foam, if any, settle. Pour through a fine sieve into your form. The sieve collects any cooked egg and pieces of large nutmeg. Try not to let the foam flow on top as it forms a disagreeable crust which you must remove after baking. Place the larger dish in the oven, then your custard dish inside. Pour hot water around the outside about 2/3 of the way up the form. Bake for 20 to 30 minutes (depends on how thick your royale is) or until set. Let the royale cool for 20 minutes or more (you may also refrigerate), then unmold onto a cutting surface by loosening the sides of the custard with a knife and then gently sliding or flipping the custard out of the form. If you used a flat form, you can cut the royale immediately into fancy shapes such as diamonds. You may also use a cookie cutter. If you baked the royale in a teacup or smaller form, you must cut the custard into quarter or half inch layers with a knife and use the individual layers to cut fancy shapes. To serve, place several pieces in the bottom of a soup plate, pour hot broth over it and garnish with herbs as desired. Do not cook the royale in the broth because it cannot take much handling and the broth will become cloudy. A good “Eierstich” is known for its smooth, velvety texture, which is a bit like soft tofu. If the water in the water bath comes to a boil in the oven the royale will become porous and if you beat air into it before it is baked the same thing could happen. Other methods for cooking “Eierstich” include cooking it in a zip top plastic bag in a water bath, cooking it in simmering water on the stove top and cooking it in a double boiler method over the potato pan. None of these guarantee a smooth product but are less complicated. The egg to yolk ratio usually cited is one extra yolk per egg. The more milk you add, the softer the royale (harder to handle). Some “Eierstich” recipes contain no milk or cream, or just a little. Experiment until it works for you. I’m always looking for quick, easy, delicious recipes which serve well as left overs or for lunch the next day. 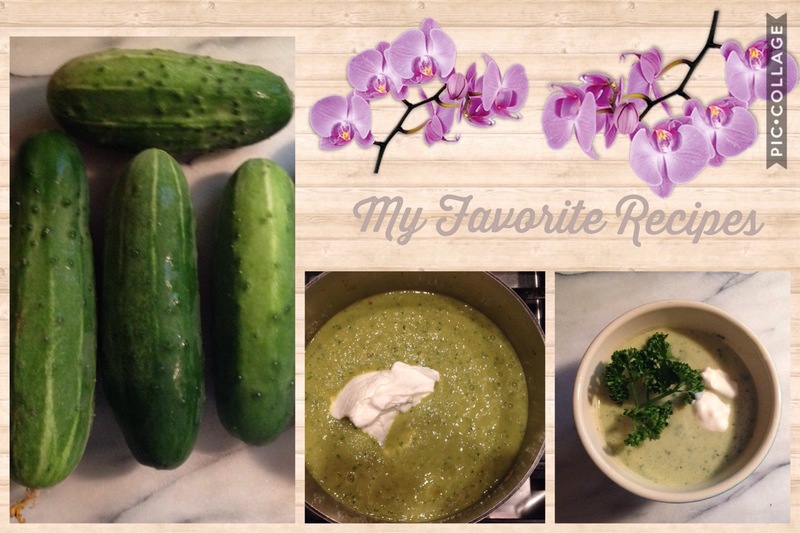 This cucumber soup is an ideal Dinner/Lunch option. The soup also serves well cool and makes an ideal, refreshing lunch on a hot summer day especially if you like to get outside of your cubical world during your lunch hour. Heat oil in a large saucepan over medium-high heat. Add garlic and onion; cook, stirring occasionally, until tender, 1 to 4 minutes. Add lemon juice and cook for 1 minute. Add 3¾ cups cucumber slices, broth, salt, pepper and cayenne; bring to a simmer. Reduce heat and cook at a gentle simmer until the cucumbers are soft, 6 to 8 minutes. Transfer the soup to a blender. Add avocado and parsley; blend on low speed until smooth. (Use caution when pureeing hot liquids.) Pour into a serving bowl and stir in yogurt. Chop the remaining ¼ cup cucumber slices. Serve the soup warm or refrigerate and serve it chilled. Just before serving, garnish with the chopped cucumber and more chopped parsley, if desired. As it turns out, when you start to conceive a soup for March, there are a number of things to think about. Which half – the “in like a lion” or the “out like a lamb” part – do you capture? Do you take into account Punxsutawney Phil’s ominous scrabblings, or do you celebrate the early vestiges of the spring you feel coming? Do you blitz together creamy, lingering winter flavors, or do you fly light and bright and vegetal, in hopes of what might be just over the horizon? Line a baking sheet with parchment paper. Pour a tablespoon of Parmesan on to it and repeat. Spacing 1/2 inches. Bake for 3 to 5 minutes or until golden and crisp. Stay fresh in refrigerator for about a week.